There are basically two conditions that must be met for me to be happy about a restaurant choice. Two necessities and I’m a happy man. Those are good food and great beer. There was a time that getting these two together in one place was nearly impossible, but back in 2006 Chris Dilla made it happen in a big way when she opened the first Bocktown Beer and Grill in Robinson Twp. Since opening the restaurant and craft beer destination was a total success, drawing fans of craft beer and amazing food from both Pittsburgh and Beaver County alike, the love for Bocktown spread and the rumblings for a second location started to be heard. Thankfully, in 2011 Chris opened the second Bocktown, lovingly nicknamed “B2” at the Beaver Valley Mall in the spot left vacant by Humphrey’s. I just wanted to go to a place like it, and couldn’t find it. In my mind, my ideal restaurant was exactly what I built in Bocktown. I wanted good beer and good food under one roof and I wanted it available until late night, in our case, midnight each day, and as a 40 year old woman, I also wanted a place that was friendly and comfortable for people of all ages. It is truly a come as you are place. We are a restaurant, not a bar, which happens to also have an excellent craft beer portfolio and a pub atmosphere. 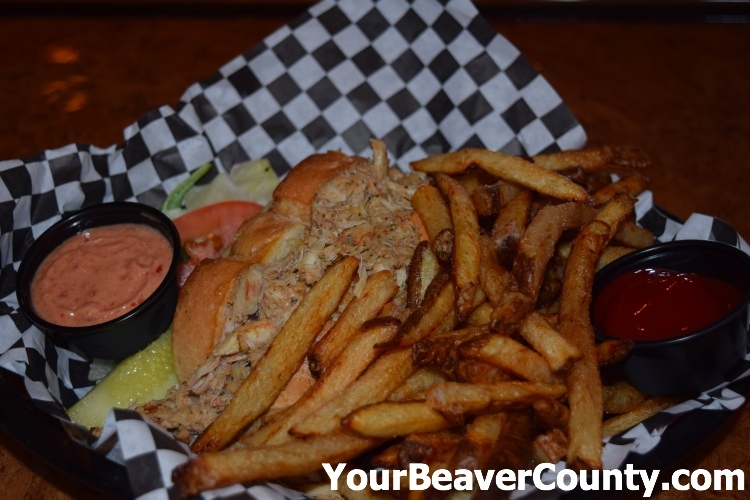 Bocktown Monaca is definitely a craft beer destination hiding inside a restaurant with amazing food. From their ‘Dahntahn’er, which is char-grilled skewers of filet mignon with jumbo shrimp and mushrooms, to my personal favorite the Crab Roll, the selection and quality of food is off the charts good. While I’d be remiss to not mention beer at a restaurant named Bocktown, the food is good enough to mention first. As with any meal I have at Bocktown, let’s start with the appetizers, or as they’re called at Bocktown, Snacks N’at. Personally, I love the artichoke dip as well as the clam strips. These are my go-to menu items almost every visit, but there’s more than enough for everyone to find one they love. If sandwiches are your thing, you’re good to go here, too. There’s a little of every type of sandwich on the menu and while I tend to go for the crab roll or Port Authority, which is a portabella cap sandwich with coleslaw, pickles, and Untouchable Sauce on a deli bun, the B.E.L.T.CH is a popular choice, too. If a dinner is more appealing to you, then you definitely need to try the Omega Goodness, which is pan-seared salmon finished with an orange balsamic drizzle and steamed rice. For the carnivores out there, Bocktown has dishes like the Live-a-Little, which is a 10-ounce steak that’s thick cut and served with mashed potatoes and vegetables. Insider Tip: Want to know a secret? Bocktown serves grass-fed burgers daily, but they’re often not on the menu. If amazing burgers are your thing (and why shouldn’t they be) then all you have to do is ask. Don’t try a secret handshake though, as the server will probably just think you’re weird. Best part about this? The beef is raised in Hookstown, PA so when you get one you’re keeping it local. I think the success we feel at Bocktown is fueled by the success of the artisans that brew, and their attention to quality and taste. We are all demanding choice in our coffees, our water, even our vodka. It is nice to see that now we have many, many choices in craft beer. 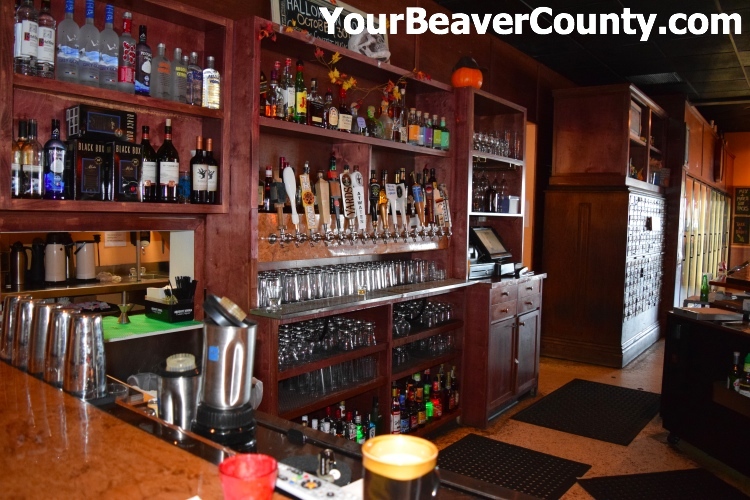 These choices are displayed at Bocktown Monaca in their 400 different bottles and 16 continuously rotating American craft beer taps. Just one look through Bocktown’s “Beer Library” is more than enough to see that this is definitely the place for beer. Bocktown focuses on their beer selection as much as their food selection and makes sure that there’s a beer for every taste on tap and in stock all the time. You’ll find higher ABV offerings from breweries like Dogfish Head and Stone Brewing Co. as well as sessionable IPAs, porters, and even some fruity and cider offerings from a variety of breweries both inside PA and around the country. Bocktown has an amazing environment that’s clean, open, and welcoming for just about any size group of people, including just one. Chris and the entire Bocktown staff believe in keeping things as local as possible with their beer and food purchases, and they all believe strongly in knowing about both their food and their beer. So, if you’re looking for great food, great beer, or like me you need both to be happy, Bocktown should be on your list for lunch or dinner. Brian is a nut when it comes to all things local, especially beer. Born and raised in Center, he now resides in Beaver, loving every minute of it. A technology nut and freelance writer extraordinaire, he knows all the secret spots and things to do in the Beav.  Archived in Food, Restaurants and tagged archive, beaver valley mall, bocktown, monaca, restaurants.